Severe flooding in India’s southern Kerala state this month led to the deaths of more than 480 people, displaced 1.8 million others, and left thousands of workers in the vital agriculture, industrial, and tourism sectors without jobs. Officials estimate it could take several years to rebuild basic infrastructure following the state’s worst floods in nearly a century. Photojournalist Shawn Sebastian recently spent four days in Kerala, getting a first-hand look at the region’s “new normal”. He found miles of damaged roads, thousands of ruined houses, thousands of hectares of lost crops, and numerous washed-out bridges. Kerala citizens told him of their own personal losses: dead livestock, damaged homes, and lost livelihoods. As of 28 August, more than 1.4 million people were in evacuation centres, according to India’s disaster management agency. Total damages are estimated at $3 billion, according to the state finance minister, Thomas Isaac. Reconstruction of homes is the first order of business, the state’s head of disaster management, P.H Kurian, said. Government officials and engineers are promising interest-free loans to help the most severely affected rebuild their houses and re-establish their livelihoods. Indian Prime Minister Narendra Modi has pledged $85 million towards relief efforts and turned down most foreign assistance, refusing an offer of $100 million in aid funds from the United Arab Emirates. That move was widely criticised, including by Isaac. The government is also coming under criticism from environmentalists like Madhav Gadgil, who suggests many deaths and significant damage could have been avoided if mining and development had been curbed in the Western Ghats – a stretch of mountains that runs along the state’s western border and is considered one of the most biodiverse areas in the world. Most of the 400 deaths occurred during landslides, which Gadgil and others say were caused by increased stone quarrying, deforestation, and construction in the mountains. This man was rescued by fishermen as water reached the roof of his home. He says he and his family now live at a government camp for displaced people but return to their home daily to clean it bit by bit. More than 30 percent of flood-damaged homes had been cleaned by 25 August, allowing thousands of people to return from camps, a tweet by the chief minister’s office stated. Families will receive 10,000 INR (about $142) from the state government to help with rebuilding and clean-up costs. Streets are lined with drenched items placed out to dry, including documents such as identity cards and diplomas. 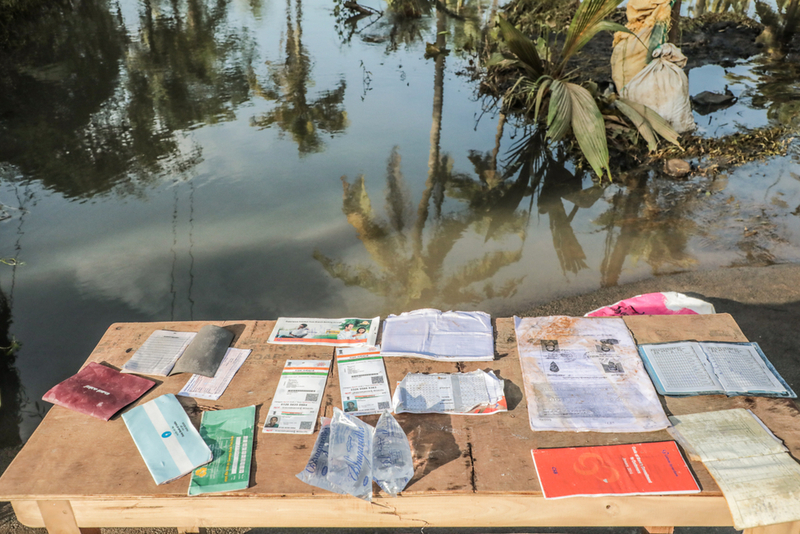 Thousands of people lost personal documents and papers when they fled their homes. The government is considering how to help people replace basic identity documents, including developing software that would allow access to digitised versions of their papers. This stationery shop owner says his business is ruined and he is uncertain about how to rebuild it. The state is considering interest-free loans of up to 10,000 INR, or $142, for some business owners. The first floor of this school was under water during the worst of the flooding. Schools across the state were shut following the flooding, which peaked on 16 August. The government says that all schools will be open again by 3 September, and new textbooks have been printed to replace those damaged by water. These women face the task of clearing mud and other detritus from their home. Government workers and civilian volunteers are pitching in to clean private homes, with more than 70,000 people taking part in a recent clean-up effort in the Kuttanad region. This couple returned to their home to empty it of ruined goods. Many families are left with useless items, from kitchen utensils to clothes to electronic appliances. As in many emergency situations, the elderly and disabled have been disproportionately affected by the flooding and often lack resources and skills to rebuild and repair their homes. Public and religious buildings now serve as camps for those still displaced by flood damage. Volunteers from a Junior Red Cross Society served lunch at one camp. Private groups and individual volunteers have joined government efforts in ensuring the camps have adequate supplies. The government has recommended that to prevent the spread of water- and vector-borne diseases people wear face masks and take other precautionary measures while cleaning their homes. Health hazards also include snake bites, which have already caused several deaths. Water was shut off in all but one district of Kerala state after the flooding, and clean water is still scarce. In some regions, volunteers are providing clean water. Electrical service has been restored to nearly all areas, government officials said on 25 August.